^ Keown, Damien. (2003). A Dictionary of Buddhism, p. 82. Oxford University Press. ISBN 0-19-860560-9. ^ Georges Dreyfus. The Shugden Affair: Origins of a Controversy (Part I). Official website of the Office of His Holiness the 14th Dalai Lama. 2013-11-03. （原始内容存档于2013-11-03） （英语）. （英文） Higgins, David. 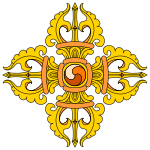 "An Introduction to the Tibetan Dzogchen (Great Perfection) Philosophy of Mind." Religion Compass. Volume 6, Issue 10, pages 441–450, October 2012, DOI: 10.1111/rec3.12004. First published online October 9, 2012.